Canada Post has commemorated this year’s summit of «La Francophonie» being held in Quebec City with a special stamp issued on October 15th. 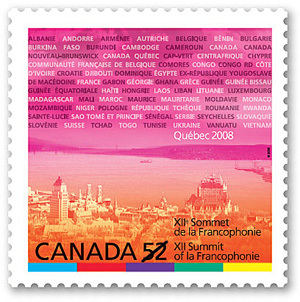 It is richly coloured and features a picture of Quebec City with the name of each of the participating members of the summit listed across the top. With the issuing of this stamp we are reminded of Canada’s role in founding the society in 1970. What is «La Francophonie» ? It is an international organization of French-speaking countries, governments and communities whose goal it is to promote the French language and culture in the world. Every two years participating nations gather to discuss relevant issues at a summit. Some of the issues discussed at this year’s XII summit in Quebec City: the ecology, children’s rights, and the promotion of tourism is southern French-speaking countries.